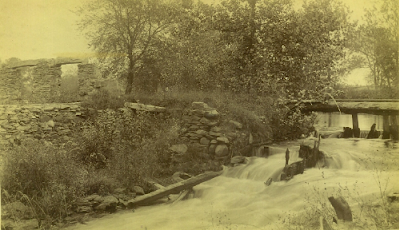 View of the Nemasket River at Muttock, Middleborough, MA, photograph, late 19th century. Nature encroaches upon the colonial and Federal-era industrial site at Muttock, obscuring the stone foundations and walls which were once part of Abiel Washburn's shovel works. Though a number of proposals called for the revival of industry at Muttock following the mid-19th century when the last operations - the grist and saw mills - were abandoned, nothing came of these initiatives. The site was left to decay, though it became a popular locale for early photographers, including the unknown one who captured this image of a boy fishing in the river. Today the site is better known as Oliver Mill Park. Many of the same ruins may be viewed today, and the site remains popular with photographers.